ATTORNEY GENERAL letter on Pacheco Cemetery public title. THIS SITE is in a process of continuing construction. Please check on our progress from time to time! WHEN gold was discovered in January of 1848 by James Wilson Marshall while he was building a saw mill for Captain Johann (John) Sutter on the South Fork of the American River in what is now El Dorado County, little did the world anticipate the events that followed. The word of the gold discovery in the newly won territory of the United States, drew thousands of men, women, and children from every civilized and uncivilized corner of the earth to this California, the land of golden treasure. HISTORIANS have well documented these events, detailing for readers and students the way in which California became settled as the country's 31st state in the Union. The vast wealth that was produced from nuggets and flakes of the golden metal, made millionaires of some and beggars of others. More went home empty handed than ever walked away with their pockets full of gold. LESS has been written, however, about the thousands of men, women and children who came here and made California their final resting places - their last homes on this earth. In El Dorado County, alone, it is estimated that some five to ten thousand people died between 1848 and 1900 whose graves within the historic cemeteries cannot be found either by record document or by graves marked in the cemeteries. FORGOTTEN sons and daughters, some have called them, for their unmarked graves were left to the care of the people of El Dorado County in graveyards and cemeteries that, today, remain as the only evidence of many of our early towns and mining camps. Several of these hallowed burying grounds, like the communities they once represented, have also disappeared in the years since the world first rushed in. CEMETERIES of mining camps and towns with the strange names of Bottle Hill, Georgia Slide, Rattlesnake Bar, Wisconsin Bar, Maine Bar, and others, quite simply cannot be found, although the documentary evidence is that they once existed. Many of these places, like the towns and camps, were simply just abandoned as word of gold strikes elsewhere rippled through the Mother Lode. SOME, however, have begun to disappear or suffer in more recent times. With residential and commercial development at an all time increase in El Dorado County, we have documented the wholesale destruction and desecration of our historic cemeteries that appears to match the new rush of humanity now emigrating to this once rural county. SO appalled we were that, in 1996, a small group of citizens founded and chartered the EL DORADO COUNTY PIONEER CEMETERIES COMMISSION (EDCPCC) to research and study the history of the cemeteries to learn and document what has occurred and is occurring to these valuable and irreplaceable historic and cultural resources. ALTHOUGH we have performed extensive research documenting the cemetery histories, establishing their extensive use (some are still being used by the public today), as well as lack of plat maps or records, since our formation, the single biggest obstacle we have faced has been to try to convince the County of El Dorado that California state law vested title to these places in the public. PLEASE accept our invitation to review our findings for the many cemeteries we have studied. What you may learn will not always be pleasant. We have attempted to learn the truth of what has happened and is happening to our historic cemeteries. Their stories are nearly as dismal as their physical condition today. THE next time you visit an historic cemetery, look around. Take note of the common rock grave markers, the mounds and depressions devoid of any marker at all. If the cemetery is still being used for current interments and you do not see these evidences of early unmarked and unknown graves, ask yourself, "What's wrong with this picture." And then contemplate who is or will serve as guardian of the graveyards and cemeteries where your loved ones rest in peace. How peaceful is it? * My Herrick and Page families came from Wisconsin to California between 1850 and 1851. They first settled at Drytown in El Dorado County (now Amador County). 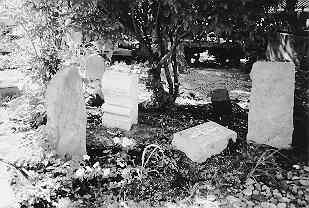 They were Amador County Pioneers who are buried in unmarked graves in the Plymouth City Cemetery, Amador County, California. Thank you for visiting the El Dorado County Pioneer Cemeteries Commission website. Please contact us if you would like further information about the cemeteries or would like to become a member of EDCPCC.